A properly managed storeroom is the difference between having parts when you need them and spending too much time and money getting them when the need becomes critical. 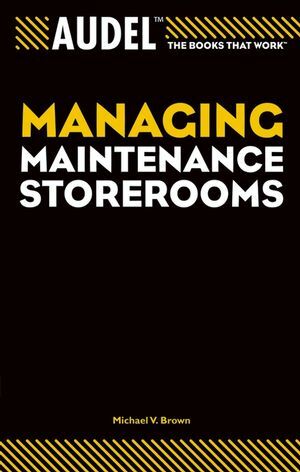 This book shows you how to plan, equip, stock, catalog, and manage a storeroom that will benefit both your workers and the company. Discover cost-effective ways to maintain essential stock, how to conduct audits, and even ways to negotiate better prices. Michael V. Brown is founder and President of New Standard Institute, a management consulting and training service that counts Shell, Merck, Coors, Kraft, and Southern Company among its clients. He has designed and implemented storeroom management, computerization, and modernization programs for numerous organizations. Chapter 1. Maintenance Materials Management. Chapter 2. Storeroom Layout and Stocking Methods. Chapter 3. Inventory and Control Procedures. Chapter 4. Storeroom and Inventory Control Improvements. Chapter 6. Computerized Inventory Management Systems. Chapter 7. Purchasing for the Storeroom. Appendix A: Item Description Examples. Appendix B: Maintenance Policy and Procedures. Appendix C: Skill Requirements for Storekeepers.